Chivington gained infamy for leading a 700-man force of Colorado Territory militia during the massacre at Sand Creek in November 1864. An estimated 70–163 peaceful Cheyenne and Arapaho – about two-thirds of whom were women, children, and infants – were killed and mutilated by his troops. Chivington and his men took scalps and other body parts as battle trophies, including human fetuses and male and female genitalia. Three years prior to Sand Creek, on August 2, 1861, he became the first Grand Master of Masons of Colorado. Several Freemasons, some of whom were present at the Sand Creek Massacre, objected to Chivington's actions and publicly denounced them, while others supported him. Officially, the Masons in Colorado suspended Chivington until the report from Congress, after which his membership was reinstated. The Freemasons, including Chivington and the first Governor, John Evans, were instrumental in pressing for Colorado statehood. Chivington was born in Lebanon, Ohio, the son of Isaac Chivington, who had fought under General William Henry Harrison against members of Tecumseh's Confederacy at the Battle of the Thames. Drawn to Methodism, Chivington became a minister. Following ordination in 1844, his first appointment was to Payson Circuit in the Illinois Conference. On the journey from Ohio to Illinois, Chivington contracted smallpox. He served the Illinois conference for ten years. In 1853, he worked in a Methodist missionary expedition to the Wyandot people in Kansas, a part of the Kansas–Nebraska Annual Conference. His outspoken views in favor of abolitionism put him in danger, and upon the advice of "Congressman Craig and other friends," Chivington was persuaded to leave the Kansas Territory for the Nebraska Territory. As a result, the Methodist Church transferred Chivington to a parish in Omaha, Nebraska. Chivington left this position after a year. Historian James Haynes said of Chivington's pastoral abilities: "Mr. Chivington was not as steady in his demeanor as becomes a man called of God to the work of the ministry, giving his ministerial friends regret and even trouble in their efforts to sustain his reputation." In May 1860, Chivington moved, with his family, to the Colorado Territory and settled in Denver. From there, he sought to establish missions in the South Park mining camps in Park County. He was elected Presiding Elder of the new Rocky Mountain District and served in that capacity until 1862. Controversy would begin to mar Chivington's appointment, who stopped performing his function as presiding elder. [clarification needed] Chivington was not reappointed at the 1862 conference; rather, his name was recorded as "located." According to early Methodist polity, describing a minister as "located" means that the minister has effectively been retired. Historian of Methodism Isaac Beardsley, a personal friend of Chivington, suggested that Chivington was "thrown out" because of his involvement with the armed forces, an association that would lead to Chivington's claim to infamy. Chivington's status as being "located" did not remove him completely from Methodist politics. His name appears as a member of the executive board of Colorado Seminary, the historic precursor of the University of Denver and the Iliff School of Theology. His name also appears in the incorporation document issued by the Council and House of Representatives of the Colorado Territory, which was approved by then governor John Evans. Chivington's command, among whom there was a detail of Colorado Mounted Rangers, descended the slope and crept up on the supply train. They waited for an hour in concealment, then attacked, driving off or capturing the small Confederate guard detail without any casualties. Chivington ordered the supply wagons burned, and the horses and mules slaughtered. Meanwhile, the Battle of Glorieta Pass was raging at Pigeon's Ranch. Chivington returned to Slough's main force to find it rapidly falling back. The Confederates had won the Battle of Glorieta Pass, but because of Chivington and his forces, they had no supplies to sustain their advance and were forced to retreat. Chivington had completely reversed the result of the battle. Sibley's men reluctantly retreated back to Texas and never again threatened New Mexico. In the fall of 1864, several events took place. Major Edward Wynkoop received a letter from Black Kettle requesting a peace council and an exchange of prisoners, and Wynkoop succeeded in holding a conference with multiple Cheyenne and Arapaho chiefs, including Black Kettle and Left Hand, and securing the release of some prisoners who had been taken during earlier Dog Soldier raids. Wynkoop and Captain Silas Soule, after the peace conference, traveled to Denver with both the returned prisoners and some of the chiefs. Wynkoop convinced a reluctant Territorial Governor John Evans to meet with the chiefs. Known as the Camp Weld Conference, it resulted in Evans making an offer of protection to those Indians who would surrender to Major Wynkoop at Fort Lyon. The chiefs agreed, and, after gathering their peaceful tribes, camped about 40 miles north of Fort Lyon, at Big Sandy Creek. Around the same time, Gov. Evans received permission from the War Department to found the 3rd Colorado Cavalry, which would consist of volunteers who would sign on for 100 days. The purported purpose of the regiment was to protect Denver and the Platte road, and it was assigned to the District of Colorado, commanded by Chivington. For political reasons, Evans had stoked the fears of the populace regarding Indian attacks, and he and Chivington had hoped successful military engagements against the Indians would further their careers. But most of the Indian war parties and attacks were occurring hundreds of miles away. In October 1864, the 100-day enlistment of the 3rd Colorado Cavalry volunteers was nearing an end, and Chivington's Civil War enlistment had expired, meaning he would soon lose his command position. After learning of the agreement reached with the chiefs, Chivington complained to the head of the Department of Kansas, Samuel R. Curtis, that Major Wynkoop was too conciliatory to the Indians. Curtis replaced Wynkoop with Major Scott Anthony, who agreed with Chivington's goal of Indian eradication. 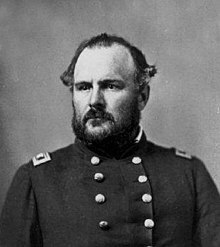 But Major Anthony requested that Wynkoop stay and advise him for a short period, despite being under orders from Curtis to end the protection of the Arapaho and Cheyenne encamped near Fort Lyon, and end the distribution of provisions that had also been promised. In November, setting out from Fort Lyon, Colonel Chivington and his eight hundred troops of the First Colorado Cavalry, Third Colorado Cavalry and a company of First New Mexico Volunteers marched nearly to the reservation. On the night of November 28, after camping, soldiers and militia drank heavily and celebrated the anticipated fight. On the morning of November 29, 1864, Chivington ordered his troops to attack. Captain Silas Soule believed the Indians to be peaceful and refused to follow Chivington's order and told his men to hold fire. Other soldiers in Chivington's force, however, immediately attacked the village. Ignoring the U.S. flag, and a white flag they raised shortly after the soldiers began firing, Chivington's soldiers massacred the majority of the mostly unarmed Cheyenne, taking scalps and other body parts as battle trophies, including human fetuses and male and female genitalia. The attack became known as the Sand Creek Massacre. A prominent mixed-race Cheyenne witness named Edmund Guerrier, said that about 53 men and 110 women and children were killed. Soule and some of the men whom he commanded testified against Chivington at his U.S. Army court martial. Chivington denounced Soule as a liar. Within three months, Soule was murdered by a soldier who had been under Chivington's command at Sand Creek. Some believed Chivington may have been involved. Irving Howbert, an 18-year-old cavalryman who later became one of the founders of Colorado Springs, long defended Chivington's role in the events. In his autobiographical Memories of a Lifetime in the Pike's Peak Region, Howbert argues that the Indian women and children were not attacked, but a few who did not leave the camp were killed once the fighting began. He said that the number of warriors in the village was about equal to the force of the Colorado cavalry. According to Howbert, Chivington was retaliating for Indian attacks on wagon trains and settlements in Colorado and for the torture and the killings of citizens during the preceding three years; evidence of attacks on the white settlers – including "more than a dozen scalps of white people, some of them from the heads of women and children" – was found in the Indian camp after the battle. Howbert also said that the account of the battle made to the United States Congress by Lieutenant Colonel Samuel F. Tappan was inaccurate. He accused Tappan of giving a false view of the battle because Tappan and Chivington had been military rivals. Chivington was soon condemned for his part in the massacre, but he had already resigned from the Army. The general post-Civil War amnesty meant that criminal charges could not be filed against him. An Army judge publicly stated that the Sand Creek massacre was "a cowardly and cold-blooded slaughter, sufficient to cover its perpetrators with indelible infamy, and the face of every American with shame and indignation". Public outrage at the brutality of the massacre, particularly considering the mutilation of corpses, was intense. It was believed to have contributed to public pressure to change Indian policy. The Congress later rejected the idea of a general war against the Indians of the Middle West. Chivington resigned from the army in February 1865. In 1865 his son, Thomas, drowned and Chivington returned to Nebraska to administer the estate. There he became an unsuccessful freight hauler. He seduced and then married his daughter-in-law, Sarah. In October 1871, she obtained a decree of divorce for non-support. Public outrage forced Chivington to withdraw from politics and kept him out of Colorado's campaign for statehood. The editor of the Omaha Daily Herald tagged Chivington a "rotten, clerical hypocrite." The early spring of 1871 he skipped as I heard afterward to Canada ... Left me without means of support. I had no desire to live with a criminal. To the end of his life, Chivington maintained that Sand Creek had been a successful operation. He argued that his expedition was a response to Cheyenne and Arapaho raids and torture inflicted on wagon trains and white settlements in Colorado. Because of Chivington's position as a lay preacher, in 1996 the General conference of the United Methodist Church expressed regret for the Sand Creek massacre. It issued an apology to the Southern Cheyenne for the "actions of a prominent Methodist". In 2005, the City Council of Longmont, Colorado, agreed to change the name of Chivington Drive in the town following a two-decade campaign. Protesters had objected to Chivington being honored for the Sand Creek Massacre. The street was renamed Sunrise Drive. The episode "Handful of Fire" (December 5, 1961) of NBC's Laramie western series is loosely based on historical events. A Colonel John Barrington, played by George Macready, and presumably modeled on John Chivington, escapes while facing a court martial at Fort Laramie for his role in the Wounded Knee Massacre in South Dakota in 1890. The Laramie episode reveals that series character Slim Sherman (John Smith) had been present at Wounded Knee and hence testified against Barrington. Then Barrington's daughter, Madge, played by Karen Sharpe, takes Slim hostage. She has papers which she contends justify her father's harsh policies against the Indians. Slim escapes but is trapped by the Sioux and must negotiate with the Indians to save the party from massacre. The American television series Playhouse 90 broadcast "Massacre at Sand Creek" on December 27, 1956. It recounted the massacre and the court-martial of Chivington, but changed the names of those involved. Chivington became John Templeton, played by Everett Sloane. Ainslie Pryor had an uncredited role as Chivington in the 1957 film, The Guns of Fort Petticoat, with Audie Murphy as Lt. Frank Hewitt, Hope Emerson as Hannah Lacey, Jeanette Nolan as Cora Melavan, and Sean McClory as Emmett Kettle. ^ a b c Laura King Van Dusen, Historic Tales from Park County: Parked in the Past (Charleston, South Carolina: The History Press, 2013), ISBN 978-1-62619-161-7, p. 33.